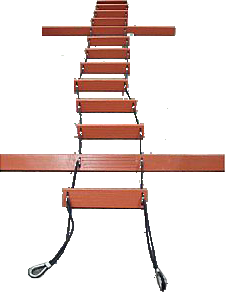 Billy Pugh Co. offers a variety of Ladders from wire, to rope, to chain ladders. Find the one that's right for you. Billy Pugh Co. offers a variety of Ladders from wire, to rope, to chain ladders. Find the one that’s right for you. C-1 Chain Ladder Flexible ladder with the following specifications: SCH 40, 1 1/2″ aluminum round rungs, 14” apart; non-skid surface; 3/16” galvanized chain; stainless steel bolts and lock nut; Aluminum Round Rung (1 1/2″ x 20″); C-1S is the same ladder as the C-1 but with the addition of 6″ aluminum “stand offs”.